WILLIAMSTOWN — “A place belongs forever to whoever claims it hardest, remembers it most obsessively, wrenches it from itself, shapes it, renders it, loves it so radically that he remakes it in his own image,” wrote Joan Didion in “The White Album” in 1979, and while I’m fairly certain she wasn’t talking about England in the early 19th century (she wasn’t; it was California), please, bear with me, because I think she makes an unintended point. That’s what I thought, at least, looking at “Turner and Constable: The Inhabited Landscape,” newly opened at the Clark Art Institute. The two towering figures of British landscape painting, born just a year apart in 1775 and 1776 respectively, are often compared for the stark rift between them, and in every imaginable way: John Constable the son of wealthy Suffolk landowners, Joseph Mallord William Turner raised above a barber’s shop in Covent Garden; Constable the meditative ruralist, Turner the manic, impulsive Londoner; Constable the steady family man, Turner the philandering cad (“I hate all married men,” he once said, a chide directed at Constable himself). Which would you make a movie about? Right. And so Mike Leigh did, in 2014, Timothy Spall chewing scenery as a dyspeptic Turner from start to finish. So it’s not much surprise, at least at first blush, to see who’s doing all of the radical wrenching here: There’s almost a gravitational pull toward Turner’s 1840 work “Rockets and Blue Lights (Close at Hand) to Warn Steamboats of Shoal Water,” a dizzying, kaleidoscopic vortex of a painting that takes pride of place at the exhibition’s outset. 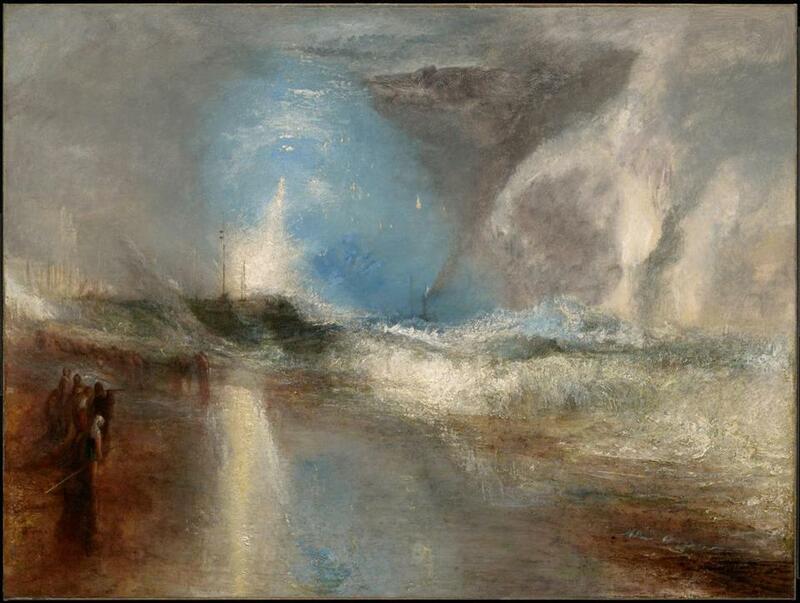 It’s the proverbial main event — Turner doing Turner to the nth degree, his dynamism tugging you toward a white-hot core burning through cloud and stormy sea. 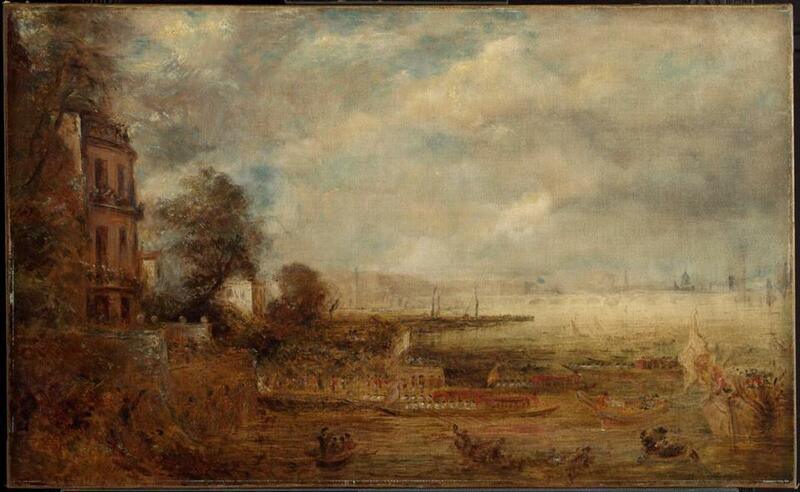 It threatens to overwhelm, and nearly does, though curator Alexis Goodin cannily counterweighs its impact with a bomb of Constable’s own: Nearby, the famously sedate and descriptive Constable’s glowering “Waterloo Bridge Seen From Whitehall Stairs,” from 1829, stands its ground, the dun and muddy foreground giving way to an enveloping, beatific haze of sea and sky. It’s almost as though they were made for each other — or against, more like, and here Goodin seems to quote a famous bit of Turner/Constable history. When “Waterloo” hung at the Royal Academy in 1832, it garnered all the attention, leaving a nearby Turner canvas of ships navigating a stormy sea neglected. “Waterloo” juxtaposed the physical and transcendent with restrained aplomb. It also made Turner furious. He looked hard at the painting and stormed out, returning with palette and brushes in hand. He added a violent swipe of red right to his own piece, right there on the gallery wall, reclaiming the spotlight with vengeful glee (you don’t have to imagine it, as Leigh’s done it for you: Spall’s defiant pout in this scene is surely one for the overacting hall of fame). Constable’s reaction — “He has been here and fired a gun,” he moped — feels defeatist, and so one of the great rivalries in the history of art unfolded. The show sets this up nicely: A pair of small works near the entrance play direct point-counterpoint, waves lapping gently on shore in Constable’s delicate seascape “Yarmouth Jetty” (1822-23), hung alongside Turner’s “View off Margate, Evening” (1840), a dark and turbulent wash of sea and sky. But the Clark show quickly departs into the unexpected, and that, ultimately, is its strength. While it’s organized in thematic chapters (“The Observed Landscape,” “The Laborer in the Landscape,” “The Built Landscape,” “The Literary Landscape”), I wondered if this was just a conventional device in which to couch some gently subversive thought. Constable may have lacked Turner’s bluster, but not his conscience. Turner’s lurching, sometimes violent works often spoke of the onrush of modernity; this was the era of industrialization and urbanization, and his painting often captured its most destructive upheavals (slaving ships, war, railways, and cargo vessels breaking trail on what would become the byways of globalization). 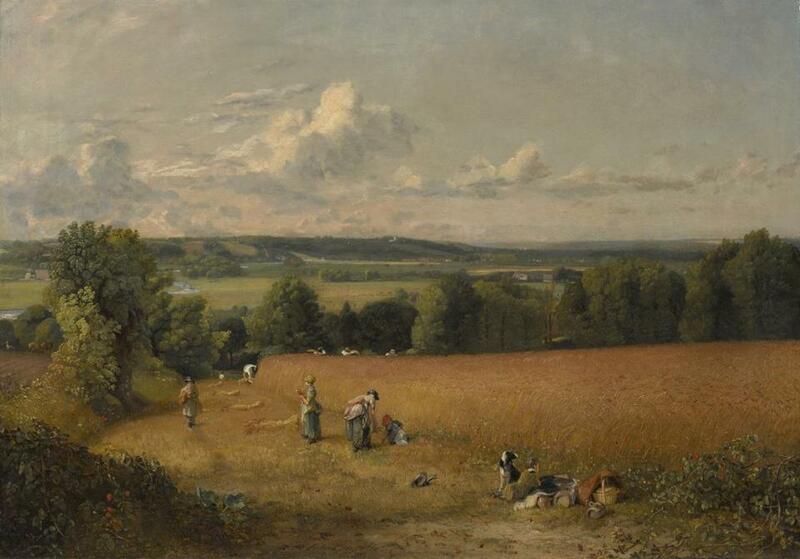 But Constable, more entrenched in rural life, was hardly detached from the shift. You can look at a painting like “The Wheat Field” (1816) and marvel at its expanse of earthy gold, or Constable’s delicate brush flicks capturing leaves rustling in the breeze so perfectly you can almost hear them, and so you should. But it’s not mere idyll. Constable, gently, as was his way, inserts a quiet elegy for the dying practice of gleaning, in which the poor would gather the leavings of a harvested crop. Look more closely and you’ll see the hierarchy play out in gender as well as class: Workers, men, hand-thresh the sheafs; women, the gleaners, bundle the castoffs; and a child sits crumpled in the foreground. Sticking with the theme, the small piece “Flailing Turnip Heads, East Bergholt,” a scene of workers on his father’s land from around 1812, feels darkly bleak and urgent, deep green trees underpinned by earth being broken by hard labor under a darkening sky. Constable will forever lack Turner’s drama. Even in small works here, Turner may depart from his urgent, spontaneous fare, but the bluster is ever-present: The wonderfully weird little “Great Yarmouth Fishing Boats,” of fishermen on boats in the harbor, is painted on blue paper and feels like a foggy window had been rubbed clean in a spot to reveal the scene beyond; the tiny watercolor “Wolf’s Hope, Eyemouth,” from 1835, is nothing short of grandiose, a mound of deep purple and near-fuchsia cloud looming with biblical fury over the settlement like the fist of a vengeful god. Bluster, though, is not everything, and as much as the Impressionists drew from Turner — his robust, spontaneous imprecision, his radical use of color — they took from Constable, too. With his restrained, closely-observed view of nothing extraordinary at all, he was a proto-practitioner of what Baudelaire, in describing Manet decades later, would call “a painter of modern life.” And then there are those skies, those transcendent, luminous skies, embodying Constable’s quiet piety that held tight to a world beyond this one. Walking through the show, Constable, it occurred to me, quietly envelops you where Turner grabs you roughly and shakes you hard. It made me wonder if one is really more powerful than the other. And it made me think — pace Ms. Didion — that maybe place need not be wrenched and loved radically to be defined, and that insistent care and observation in its quiet moments might just do the trick. Not the Hollywood ending, no. But, really, what ever is? 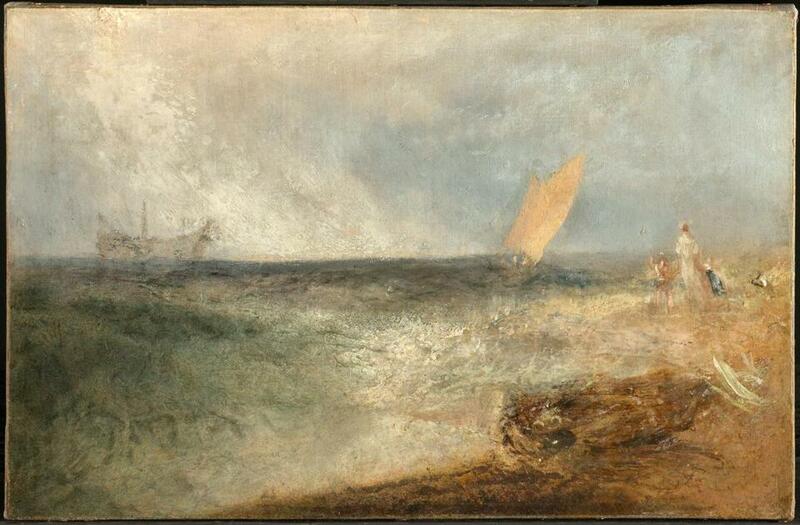 Constable, it occurred to me, quietly envelops you where Turner grabs you roughly and shakes you hard. It made me wonder if one is really more powerful than the other.